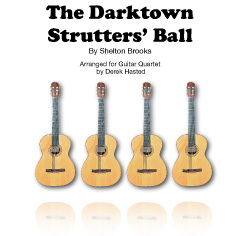 I'm pleased to tell you about another arrangement that is now published - Shelton Brooks's "The Darktown Strutters' Ball" which is for 4 guitars (or a large ensemble). The bass part is also suitable for an octave or contra guitar. Arranged with a Dixieland-jazz-stlye final chorus, this is based on the arrangement the Hampshire Guitar Orchestra used to perform and which always went down a storm with the audience.